Download our latest fact sheet here. As you develop the Labor, Health and Human Services, Education and Related Agencies (Labor-HHS) Fiscal Year (FY) 2019 funding bill, the Campaign to Invest in America’s Workforce (CIAW) urges you to include adequate investments in workforce and education to meet the needs of both businesses and workers. CIAW is a diverse coalition of national organizations that offer direct services, advocacy, research, and policy development to help people of all ages and conditions develop their skills, enter gainful employment, and enroll and succeed in postsecondary education. Our coalition applauds the subcommittee’s efforts to increase funding for many workforce and education programs in FY 2018 and to advocate for a better subcommittee allocation to increase funding for workforce and education programs without lowering support for other vital programs. Investments in our workforce and education systems are still below authorized and historic levels, however, and CIAW urges you to provide urgently needed increases in FY 2019. Today, businesses in nearly every state are struggling to find workers with necessary skills. Middle skill jobs—those requiring more than a high school diploma, but not a four-year degree—make up 53 percent of today’s labor market, but only 43 percent of U.S. workers are trained at this level. At the same time, there are millions more low-skill workers than low-skill jobs. With unemployment at just over four percent, and labor-force participation for young people and adults at historic lows, this means filling vacant middle-skill jobs will require training and upskilling workers across the country. Providing this training and the economic opportunity that comes with it is a primary goal of the nation’s workforce development system, but current funding levels make it impossible for programs to meet the vision outlined in the bipartisan Workforce Innovation and Opportunity Act of 2014. Proposed reauthorizations of the Higher Education Act and Carl D. Perkins Career and Technical Education Act will face the same challenges. Since 2001 WIOA funding has been cut by 40 percent, Career and Technical Education funding by 32 percent and Adult Basic Education funding by almost 20 percent. WIOA programs successfully serve workers who need training to access vacant middle-skill jobs. Nearly three quarters of all WIOA participants have no post-secondary education and training and 43 percent are low-income. After receiving training under WIOA, workers are able to access jobs in industries desperate for workers including health care, manufacturing, transportation and construction. Funding strong investments in CTE state grants under the Carl D. Perkins Act to support programs that reduce high school drop-out rates, equip students with workforce-relevant skills and expand a talent pool that is responsive to the needs of employers. Increase the Pell Grant maximum award and protect the future fiscal stability of the program to enable its continuation as an essential resource for students in workforce-oriented programs. Thank you for your attention to this important issue. We can’t compete if we cut. If you have questions about this letter, please contact Katie Spiker at Katies@nationalskillscoalition.org. Download House and Senate letters. adequate investments in workforce and education to meet the needs of businesses and workers. enter gainful employment, and enroll and succeed in postsecondary education. education and training opportunities for all workers. across the country, and the Secretaries of Labor and Education have heralded the importance of job training and education (respectively) to develop the pipeline of workers businesses need. Without adequate investment, however, it is impossible to realize the administration’s goals. Today, businesses in nearly every state are struggling to find workers with necessary skills. economies in countless ways. Inadequate investment, though, leaves rural and urban businesses struggling to find workers with appropriate skills, and it leaves workers without meaningful pathways to better-paying jobs. six of those seven because of insufficient federal investment. country with significant demand for skilled workers. of $4.85 for every dollar of federal investment. now provides students with the opportunity to develop skills to be college ready. youth is estimated to produce a minimum return of $10.80. increased tax revenue and heightened civic engagement across the country. mean a healthier U.S. economy for our workers and our businesses. Before we can see the returns, though, this administration must make adequate investments. well as those U.S. businesses are trying desperately to fill today. courses is about 93 percent, approximately 10 percent higher than the national average. programs aligned to needs of business and industry. programs offer an onramp to a career pathway that includes a paying job from the start. access to high-quality apprenticeship and work-based learning programs. improvement, which are particularly important in a constrained budget environment. continue to meet this vital need. KermitK@nationalskillscoaltion.org. Thank you for your attention to these important matters. The Campaign to Invest in America’s Workforce (CIAW) is a coalition of diverse national organizations that offer direct services, advocacy, research, and policy development to help people of all ages and conditions develop their skills, enter gainful employment, and enroll and succeed in postsecondary education. CIAW urges you to pass a Fiscal Year (FY) 2018 Appropriations bill that includes adequate investments in job training and adult education as you work to complete the appropriations process. We also encourage you to work with leadership to negotiate a long-term budget agreement that would include higher spending levels, end sequestration and raise harmful budget caps. Despite the growing demands for skills, the President proposed draconian cuts to vital workforce and education programs. The U.S. House Labor, Health and Human Services, Education and Related Agencies (Labor-HHS) bill would still cut hundreds of millions of dollars from funding for the Workforce Innovation and Opportunity Act (WIOA), Pell Grants for low-income and working students, apprenticeship strategies, the Senior Community Service Employment Program, and other key investments in our economic competitiveness. The Senate Labor-HHS bill funding levels are higher than the House levels and more closely aligned to FY 2017 levels. These programs, however, have already been subject to historic disinvestments: since 2001 WIOA state training grants have been cut by 39%, CTE grants to states have been cut by 34%, and Adult Education funding has been cut by 22% when adjusted for inflation. reauthorizations of the Carl D. Perkins Career and Technical Education Act and the Higher Education Act, provide unprecedented opportunities to develop the skills of America’s workers through access to effective workforce education and training. Realizing this potential, however, requires sustained funding. program to ensure that the more than 7 million low-income students receiving this critical financial assistance can continue to pursue their education. National College Transition Network, World Education, Inc.
provide adequate funding in an FY 2018 spending bill for critical programs under WIOA, the Perkins Act, the Higher Education Act, Homeless Veterans Reintegration Program, Title V under the Older Americans Act (OAA), the Corporation for National and Community Service’s programs like AmeriCorps, and related activities. Download our latest fact sheet. The Campaign to Invest in America’s Workforce (CIAW) is a diverse coalition of national organizations that offer direct services, advocacy, research, and policy development to help people of all ages and conditions develop their skills, enter gainful employment, and enroll and succeed in postsecondary education. We write to express our strong opposition to proposed cuts to vital education and training programs in the Fiscal Year 2018 (FY 2018) Labor, Health and Human Services, Education and Related Agencies (Labor-HHS) appropriations bill. The draft appropriations bill would cut $85.7 million from Workforce Innovation and Opportunity Act (WIOA) Title I state grants, and eliminates Title III Employment Services Grants, making it harder for states and local communities to provide needed skills training and services to businesses and workers. These cuts are on top of years of disinvestment – state workforce grants have declined by nearly 40 percent in real terms since 2001 – and come at a time when employers are struggling to fill nearly 6 million current job openings. The bill eliminates $95 million in funding for apprenticeship expansion and support for data collection on program effectiveness, just weeks after the White House signed an Executive Order prioritizing apprenticeship as a strategy to improve workforce education and training and calling for agencies to evaluate workforce programs they administer. The bill eliminates nearly $300 million in funding for Dislocated Worker National Reserve programs, and $100 million in funding for the Senior Community Service Employment Programs, despite continued challenges facing participants as they seek to reconnect to the labor market. The bill proposes rescinding $3.3 billion from the Pell surplus – on top of the $1.3 billion cut to Pell grants in the FY 2017 spending package – severely undermining the long-term financial stability of the program and putting vital aid for low-income students at risk. 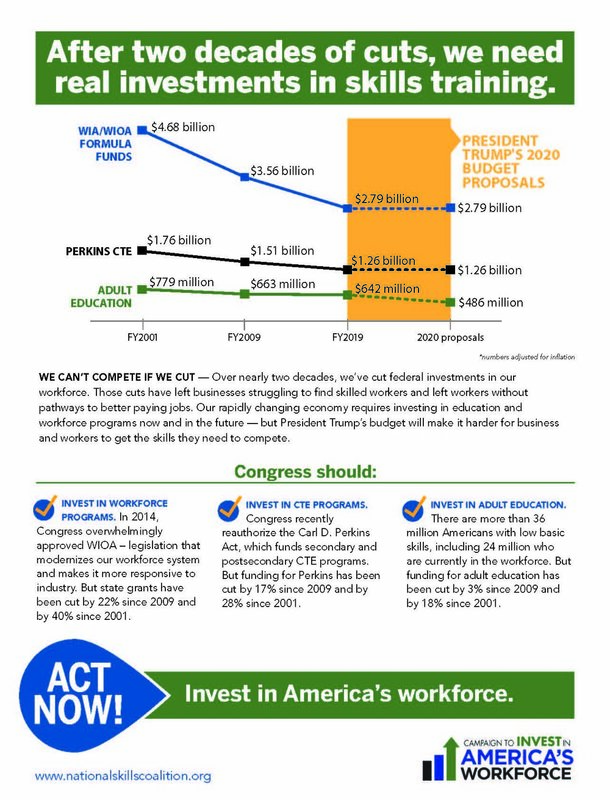 These proposed cuts would all come on top of historic disinvestments in critical workforce and education programs and the already low caps on non-defense discretionary spending under the 2011 Budget Control Act. It is critical to end sequestration and raise the harmful spending caps. In addition to cuts to Department of Labor workforce programs, career and technical education programs that prepare workers for the jobs of tomorrow have been cut by 32 percent since 2001. Investments in adult education have been cut by 21 percent since 2001. AmeriCorps is authorized to provide opportunity for 250,000 youth and veterans to serve their country and gain in-demand skills but is only funded to meet the needs of 80,000 participants. Sustaining funding - including preserving the current surplus fund - for the federal Pell Grant program to ensure that the more than 7 million low-income students receiving this critical financial assistance can continue to pursue their education. The Campaign to Invest in America’s Workforce is a coalition of national organizations whose members help people of all ages and conditions raise their skills, and enable U.S. businesses that need skilled workers to compete in today’s rapidly restructuring economy. We appreciate the opportunity to submit testimony about the funding of education and workforce programs administered by the Departments of Education, Labor, and Health and Human Services in FY 2018. Middle skill jobs—those requiring more than a high school diploma, but not a four-year degree—make up 53 percent of today’s labor market, but only 43 percent of U.S. workers are trained at this level. Further, by 2020, 65 percent of all jobs will require some level of postsecondary education. This skills gap leaves businesses struggling to find workers with appropriate skills, and it leaves workers without meaningful pathways to better-paying jobs. Lawmakers understand the importance of investing in skills to achieve broadly shared economic growth and prosperity. Congress acknowledged the need to address this issue and to reform our nation’s workforce development strategy when it passed Workforce Innovation and Opportunity Act (WIOA) by wide bipartisan majorities. WIOA contains significant changes that will help better match employers with skilled employees, fewer and better-aligned performance metrics (including a measure of effectiveness in serving employers), a simpler structure for workforce development boards, and integration of best practices such as industry partnerships and career pathways. Federal investments under WIOA, the Carl D. Perkins Career and Technical Education Act (Perkins Act), the Higher Education Act, and other key programs provide unprecedented potential to develop America’s workers through access to effective workforce education and training. For this potential to be realized, however, sustained funding is required. The administration’s budget proposes significant funding cuts across a range of federal programs, which would come on top of historic disinvestments in critical workforce and education programs and the already low caps on non-defense discretionary spending under the 2011 Budget Control Act. For example, funding for state workforce grants, which WIOA reformed to be more responsive to industry needs, have been cut by 38 percent since 2001. Since 2001, the number of students served by Adult Education has fallen from more than 2.7 million to 1.5 million, a decline of 44 percent. Funding, when adjusted for inflation, has fallen by 25.3 percent. Despite strong bipartisan support, career and technical education (CTE) programs that prepare workers for the jobs of tomorrow have been cut by 32 percent since 2001. AmeriCorps is authorized to provide opportunity for 250,000 youth and veterans to serve their country and gain in-demand skills but is only meets the needs of 80,000 participants. We simply cannot compete in an increasingly global economy if we keep cutting and eliminating effective programs while our competitors increase their investments in education and training. WIOA Title I. The President’s FY 2018 budget proposes cutting state formula grants under Title I of WIOA by approximately 40 percent, substantially undercutting investments that annually help connect nearly 7,000,000 million adults and dislocated workers to employment and training opportunities in their local labor markets. The proposed cuts come would leave states and other partners without the critical resources necessary to advance the critical system improvements envisioned under WIOA. President Trump’s budget proposes to reduce funding under WIOA for youth services by 39 percent, effectively eliminating services, especially in rural areas, that help young people reenter education or obtain employment. Each year nearly 200,000 young people, most of whom are out of school and out of work, receive services through local programs that receive WIOA Youth funding. Of the 95,000 out-of-school youth who were served in Fiscal Year 2014, 71.5 percent of program exiters entered employment after leaving the program and 69.2 percent of program exiters attained credentials of some kind, at a cost of about $3,400/youth. Adult Education, WIOA Title II. Adult education is cost-effective. Federal support for adult education leverages a significant investment by states. In FY 2013, each federal dollar invested in AEFLA generated $2.49 in non-Federal matching funds. The Federal cost per participant in FY 2012, the most recent year for which we have data, was $298. The annual Federal cost for each adult education student who advanced at least one educational level or who earned a high school diploma or its equivalent was $589. According to PIAAC (OECD’s Program of International Assessment of Adult Competencies), Americans lag behind the international average for basic skills in literacy and numeracy and “problem-solving in technology-rich environments.” Data from the Longitudinal Study of Adult Learning (LSAL), which recorded the educational and workforce experiences of a random sample of high school dropouts between 1998 and 2007, show that sustained participation in adult education increases the earnings of students. Using propensity score matching to control for observed differences between individuals who enrolled in adult education and those who did not, one study found that participating in adult education for 100 or more hours netted students an average income increase of $6,635 (in 2007 dollars). A person with a high school diploma, or equivalent, earns an average of $9,620 more per year than a non-graduate. Title III Wagner-Peyser Employment Service Programs served more than 13 million US workers and jobseekers – the equivalent of one of every twelve individuals in the labor force - during the most recent twelve month period for which we have data, providing critical job search, placement, and reemployment assistance that help connect skilled workers with local businesses. The President’s budget calls for cutting funding for the program by approximately 40 percent, which will dramatically reduce the availability of these core services in communities across the country. Apprenticeship. Despite the administration’s rhetorical support for expanding apprenticeship, the proposed budget would actually scale back these efforts, cutting federal investments by more than $5 million relative to FY 2017 levels and undermining the strong Congressional support for these valuable “earn-and-learn” models. While these cuts are less dramatic than those proposed for other federal workforce and education programs, they send a clear signal about the administration’s commitments to the kinds of job creation and training strategies that business leaders are seeking. We urge the subcommittee to reject these proposals and instead focus on strengthening these investments to develop and implement proven workforce models that will sustain US competitiveness in the years ahead. Perkins CTE. The Perkins Act supports our nation’s high schools, technical centers and community colleges to provide the education necessary to develop a highly skilled workforce. Nationally, over 11 million students benefit from career technical education (CTE) and we know it’s working: 93 percent of CTE concentrators graduate high school, approximately 10 percentage points higher than the national average. Not only do CTE students graduate high school, they’re landing in college or a career at high rates – in Missouri, for example, 94 percent of CTE high school graduates placed into college or a career in 2013-2014. Furthermore, postsecondary CTE students are obtaining the knowledge and skills they need to succeed – for example, in Washington, 100 percent of postsecondary CTE students earned a credential, certificate or degree in 2013-2014. These are just a few examples of CTE’s impact, but these outcomes cannot be achieved without an adequate federal investment in Perkins to ensure that students and jobseekers can access high-quality education and training that results in market-ready skills and credentials, and to support employers’ engagement in aligning training with their skill requirements. We request that Congress reverse prior cuts to Perkins and fund Perkins Basic State Grants at a level at least equal to FY 2010 levels, or approximately $1.3 billion. Pell Grants. The Pell Grant program remains an essential source of aid for millions of students seeking postsecondary training. Without the Pell Grant program, many of the more than 7 million individuals who receive these grants annually would find education completely out of financial reach. Yet the President’s Budget proposes to rescind $3.9 billion from the Pell Grant reserves. We urge the committee to reject this rescission and maintain the current Pell Grant discretionary baseline funding of $22.5 billion to preserve fiscal stability for the program. Additionally, Congress should consider ways to reinvest current Pell Grant surplus funds into strengthening and modernizing the Pell Grant program, such as expanding access to Pell funds for students enrolled in short term training programs leading to industry-recognized credentials and employment in local in-demand industries. Corporation for National Service (CNCS). CNCS promotes public-private partnerships with local organizations and governors, particularly through the AmeriCorps program to address critical community needs by engaging disconnected youth and veterans in high-quality, locally-driven, work-based service programs. Through those programs, students and veterans gain certifications and credentials and further education; receive education awards that can be used for training or school; and complete priority projects that are important to the community and states where they serve. Projects include disaster response, wildfire remediation, invasive species removal, infrastructure repair and development, education, construction, and community/economic development. We urge your support for funding CNCS, including the Social Innovation Fund, which was eliminated in FY17. Senior Community Service Employment Program (SCSEP). SCSEP is the only federal employment program targeted at helping older Americans -- unemployed veterans, individuals with disabilities, and other eligible jobseekers with significant barriers to employment -- find jobs. Through the program, low-income jobseekers 55 years old or older train and earn minimum wage for 15-20 hours a week through community work experiences at local non-profits and government agencies such as libraries and senior centers. Through the on-the-job training, SCSEP participants learn skills, develop new work experiences, and gain confidence to reenter the changing workforce. Annual funding allows employment providers to assist about 67,000 older workers from nearly all 3,000 U.S. counties and territories. Of the thousands of older workers who secure unsubsidized employment because of SCSEP, more than 70 percent remained employed one year after exiting the program. We urge the subcommittee to fund SCSEP at the OAA authorized level in FY 2018. Community Services Block Grant (CSBG). It is essential to maintain or increase funding for the Community Services Block Grant (CSBG), which President Trump’s Fiscal Year 2018 budget proposes to eliminate. The community action agencies (CAAs) funded by CSBG leverage enormous non-federal resources: for each federal dollar, CAA’s leverage $7.70, including $2.34 of private resources, according to Community Action Partnership. Each year CSBG reaches 15.6 million Americans with services that are often what keeps families from choosing between food on the table and heat in the house. In this way CSBG reduces poverty, revitalizes low-income communities, and empowers low-income families and individuals on the road back to self-sufficiency. Homeless Veterans’ Reintegration Program (HVRP). Despite the significant decrease in veterans’ homelessness since 2010, nearly 40,000 veterans remain homeless, including 13,000 who are living on the streets. Employment is critical to the prevention of and successful transition out of homelessness. Congress created HVRP to address the employment barriers and training needs of homeless veterans. DOL partners with community-based organizations on HVRP to provide and coordinate skills training, job placement and support services to help at-risk veterans reintegrate into the labor force and secure stable housing. About 17,000 veterans benefit annually from HVRP services HVRP exceeded its placement rate, placing 68.7 percent of all HVRP participants, including a 64 percent placement rate for female veterans (the fastest growing segment of our country’s homeless population). An additional 5,000 homeless veterans could be served if Congress funded HVRP at its authorized level. We must invest in education and workforce programs because the economy of the future requires it. Urban and rural areas both need trained employees. As of 2016, there were 476 counties in the US in which 20 percent or more of the working age population lacked a high school diploma or equivalent. Eighty percent are located in non-metro areas. We cannot depend on a robust economy alone to solve this problem. A stronger economy will bring people back into the workforce but it won’t train them. Investments in America’s workers’ skills and education are critical to businesses, workers, and the economy. We are mindful of the constraints under which the Subcommittee must operate. Nevertheless, we urge you to invest in the future and fund these programs at least at their authorized level. Download the full testimony here. The Campaign to Invest in America’s Workforce (CIAW) is a diverse coalition of national organizations that offer direct services, advocacy, research, and policy development to help people of all ages and conditions develop their skills, enter gainful employment, and enroll and succeed in postsecondary education. CIAW urges you to include adequate investments in job training and adult education as you work to complete the Fiscal Year (FY) 2018 appropriations process so these programs have the capacity to meet the Administration’s job creation goals. Funding critical investments in workforce and education strategies is essential to ensure businesses have access to workers with appropriate skills. CIAW urges you to invest in the upskilling of American workers and reject proposed cuts to training and education in President Trump’s budget proposal. Middle skill jobs—those requiring more than a high school diploma, but not a four-year degree—make up 53 percent of today’s labor market, but only 43 percent of U.S. workers are trained at this level. This skills gap leaves rural and urban businesses struggling to find workers with appropriate skills, and it leaves workers without meaningful pathways to better-paying jobs. Congress has acknowledged the need to address this issue and to reform our nation’s workforce development strategy. In 2014, the Workforce Innovation and Opportunity Act (WIOA) was signed into law after being passed by wide bipartisan majorities in the House and Senate. WIOA contains significant changes that will help better match employers with the skilled employees they need to grow. These include fewer and better-aligned performance metrics (including a measure of effectiveness in serving employers), a simpler structure for workforce development boards, and integration of best practices such as industry partnerships and career pathways. Final regulations to implement WIOA were completed last year. As a result, states are now finalizing their plans to align their employment and training programs with regional economic development strategies that benefit businesses and workers alike. Maintaining funding for WIOA implementation is needed for states to fully carry out congressional reforms. Doing so will improve our nation’s economic competitiveness and ensure comprehensive workforce strategies are in place to support national priorities, such as rebuilding our infrastructure. President Trump’s budget contains significant cuts that threaten to undermine this progress. The proposal includes approximately $9 billion in cuts to the Department of Education, or 13 percent below current funding levels. It also cuts $2.5 billion from the Department of Labor, or about 21 percent below current funding levels. The proposal does not provide clear guidance on where the bulk of the cuts would be made, but it indicates that there are likely to be major cuts to workforce and Wagner-Peyser Employment Service formula grants under WIOA. WIOA, as well as the upcoming reauthorizations of the Carl D. Perkins Career and Technical Education Act and the Higher Education Act, provide unprecedented potential to develop America’s workers through access to effective workforce education and training. For this potential to be realized, sustained funding is required. However, we are deeply concerned by Administration proposals that would make draconian cuts to essential programs – even cutting programs that provide businesses with the skilled workers they need. These cuts would come on top of historic disinvestments in critical workforce and education programs and the already low caps on non-defense discretionary spending under the 2011 Budget Control Act. Funding for state workforce grants, which WIOA reformed to be more responsive to industry needs, have been cut by 38 percent since 2001. Despite strong bipartisan support, career and technical education programs that prepare workers for the jobs of tomorrow have been cut by 32 percent since 2001. Investments in adult education have been cut by 21 percent since 2001. AmeriCorps is authorized to provide opportunity for 250,000 youth and veterans to serve their country and gain in-demand skills but is only funded to meet the needs of 80,000 participants. CIAW urges you to maintain parity between defense and non-defense spending levels, and recommend adequate funding for critical programs under WIOA, the Perkins Act, the Higher Education Act, Homeless Veterans Reintegration Program, Title V under the Older Americans Act (OAA), the Corporation for National and Community Service’s programs like AmeriCorps, and related activities, as part of the Administration’s FY 2018 budget request. You can find further details regarding specific funding recommendations in the attached, “Funding Challenges: Adult and Youth Education and Training for FY2018.” All related programs should be funded at least at the authorized levels set by Congress. If you have questions about this letter or its attachments, please contact Paul Seifert, CIAW Convener, at paul.seifert@goodwill.org or 240-333-5478. Thank you for your leadership, your commitment, and your attention to these matters that are so important to unlocking our nation’s true job creating potential. Fund WIOA Title I employment and training programs at least at statutorily authorized levels so states, local areas, and other partners in the public workforce system can fully realize the bipartisan vision outlined by WIOA. This includes state adult, dislocated worker, and youth formula grants under Title I-B, the Job Corps program under Title I-C, and national grants under Title I-D. The nation’s workforce system plays a critical role in meeting the skill needs of high demand employers and of regional economies. In PY 2015, the system served over 6.8 million participants, two-thirds of whom (over 4 million people) were placed into employment, many of whom were provided with the skills needed by employers through workforce training programs. Fund adult education and literacy programs under Title II of WIOA at least at authorized levels to ensure that Americans with low basic skills are able to strengthen their educational levels in order to take advantage of emerging economic opportunities. OECD research shows 36 million adults in the U.S. have low basic skills, yet current funding only supports serving about 1.7 million eligible participants a year. Fund Wagner/Peyser Employment Services (ES) activities under Title III of WIOA at current levels to give states the necessary resources to provide WIOA’s intensive reemployment services while implementing the new law. Fund the vocational rehabilitation program and other employment services authorized under WIOA Title IV for adults and students with disabilities. Substantial updates to Title IV require important updates to our workforce development system’s service delivery to individuals with disabilities. These updates reflect the bipartisan understanding that significant barriers to employment exist for many with disabilities. Investment in these individuals would boost their access to the training and education necessary to develop skills employers value. Fund job training and employment services for older workers and veterans authorized through the Older Americans Act and other laws at no less than level funding. Title V of the Older Americans Act authorizes the Senior Community Service Employment Program (SCSEP), the only federal workforce development program targeted to serve older Americans. Last year, more than 65,000 low-income jobseekers ages 55 years and older updated their skills through on-the-job SCSEP training and provided nearly 35 million hours of support to libraries, senior centers, schools and other community- and faith-based organizations across the country. The Homeless Veterans’ Reintegration Program is the only federal nationwide program focused exclusively on the employment of veterans who are homeless or at risk of homelessness. Last year, 17,000 veterans received job training and employment supports through HVRP. Funding at the authorized level of $50 million would mean an additional 5,000 homeless veterans could be served through HVRP. Maintain or increase the $90 million investment in apprenticeship programs. This investment ensures that apprenticeship programs across the country continue to grow and better serve workers seeking training and employers that need to hire them to support the expansion and growth of their businesses. Attention should also be paid to engaging pre-apprenticeship programs to increase opportunity for new partnerships and new types of apprenticeship programs. Support necessary funding to support Career and Technical Education (CTE) – The Carl D. Perkins Career and Technical Education Act (Perkins Act), which supports our nation’s high schools, technical centers and community colleges in providing the education necessary to develop the highly skilled workforce demanded by employers, has been cut more than 30 percent since 2001. These cuts are incompatible with our nation’s increased need for skills obtained in CTE education and training programs. Federal workforce and education investments must be targeted so jobseekers can access high-quality education and training that results in market-ready skills and credentials, and to support employers’ engagement in aligning training with their skill requirements. The Administration’s request should reflect additional funding necessary to restore and strengthen the investment in the basic state grant and implement the programmatic changes of the impending reauthorization of Perkins, including additional discretionary funds to support the development and implementation of innovative CTE strategies, including partnerships between CTE providers, employers, and other key stakeholders. The Administration should request at least FY 2010 levels, or approximately $1.3 billion. Reinstate year-round Pell Grants. Providing Pell Grants beyond the current two semesters or three quarters could increase persistence and graduation rates by forestalling summer learning loss and giving students the opportunity to complete their degrees more rapidly. Students need more flexibility in accessing financial aid. In particular, low-income students should be able to enroll continuously. We urge the reinstatement of the year-round Pell Grant in order to support student persistence and on-time completion. Expand access to Pell funds for students enrolled in short term training programs leading to industry-recognized credentials and employment in local in-demand industries. Current restrictions on access to Pell funding limits credential attainment by students who cannot afford to access longer term training programs and stifles job growth as businesses can’t access trained workers. Fully reinstate Pell Grant eligibility for “ability-to-benefit” (ATB) students. In 2012, Congress eliminated Pell Grant eligibility for all new ATB student in order to close a funding shortfall. ATB students lack a high school diploma or GED, yet have proven their abilities to benefit from college-level coursework either through the successful completion of classes (six credits) or by passing a test. Over the past two fiscal years, Congress has begun to incrementally reinstate Pell Grant eligibility for ATB students. Moving forward, the program should be reinstated back to its original, pre-FY 2012 structure. This would allow more students to access this essential aid. Maintain the current Pell Grant discretionary baseline funding of $22.475 billion in order to preserve fiscal stability for the program. Maintain mandatory funding for the Pell Grant program. Cutting or eliminating mandatory funding for the Pell Grant program would potentially result in a multi-billion shortfall in future fiscal years. Support AmeriCorps and the Corporation for National and Community Service (CNCS) – The CNCS is structured to promote public-private partnerships with local organizations and governors), particularly through the bi-partisan AmeriCorps program, in order to address critical community needs by engaging disconnected youth and veterans in high-quality, locally-driven, work-based service programs. Through those programs, students and veterans gain certifications and credentials and further education; receive education awards that can be used for training or school; and complete priority projects that are important to the community and states where they serve. Projects include disaster response, wildfire remediation, invasive species removal, infrastructure repair and development, education, construction, and community/economic development. We urge your support for funding CNCS and its critical programs like AmeriCorps State and National, AmeriCorps VISTA, AmeriCorps NCCC, and the State Service Commissions. The Campaign to Invest in America’s Workforce (CIAW) – a diverse coalition of national organizations calling for strong federal investments to help U.S workers and businesses gain the skills necessary to compete in today’s rapidly restructuring economy – urges you to ensure that key education and workforce programs are adequately funded as you work to complete the Fiscal Year 2017 appropriations process. CIAW urges you to adopt the greater of the House- or Senate-proposed FY 2017 appropriations for our nation’s workforce programs, including but not limited to those authorized in the Workforce Innovation and Opportunity Act (WIOA), the Carl D. Perkins Act, the Higher Education Act, the Older Americans Act, and other federal programs that help Americans gain family-supporting jobs. These vital programs play a critical role in the effort to sustain our economic growth and reduce income inequality. They are essential to ensuring that American businesses can find the skilled workers they need to compete; and U.S. workers may share in the economic prosperity of our nation. They have enjoyed strong bi-partisan support but their impact would be magnified if they were adequately funded. Without meaningful investments in a skilled workforce, skill gaps will stifle job growth and threaten our nation’s economic competitiveness. While U.S. unemployment has declined to pre-recession levels, there are millions of jobs unfilled and millions of Americans who lack the skills and credentials to fill them. We cannot compete if we continue to cut these critical programs. Maintain funding for the federal Pell Grant program to ensure that the more than 7 million low-income students receiving this critical financial assistance can continue to pursue their education. Investments in America’s workers’ skills and education are critical to businesses, workers, and the economy. Again, we urge you to fund these key workforce and education programs at levels that will keep our nation competitive. Thank you for your leadership and attention to these important matters. National College Transition Network, World Education Inc.